The New England Patriots have decided to keep backup quarterback Jimmy Garoppolo this offseason despite the interest from several teams including the pick-laden Cleveland Browns. However, sports analyst Skip Bayless believes that this move by the Patriots will eventually get Bill Belichick to clash with Tom Brady. According to Ian Rapoport of NFL.com, the Browns and the Houston Texans have given up on their pursuit of Jimmy Garoppolo, who served as the backup to Tom Brady since the 2014 season. Rapoport also noted that the Patriots view the 25-year-old as a franchise quarterback. It is despite the fact that Tom Brady may play for six to seven years to break several NFL records held by Peyton Manning and Brett Favre. He still plays at a high level and it would be interesting to see if he will continue to play at that lever next season onwards. The Patriots drafted Jimmy Garoppolo in the second round of the 2014 NFL Draft. He was the highest drafted quarterback in the Tom Brady era and many view him as the heir apparent to the greatest of all time. However, Skip Bayless of FOX Sports believes that the decision of the Patriots to retain Garoppolo will have an effect on the relationship between Brady and Belichick. In Monday’s episode of Undisputed with Bayless, Shannon Sharpe and Eric Mangini, Bayless pointed out that the Patriots will have to decide between Jimmy Garoppolo and Tom Brady. The younger QB will be a free agent at the end of the season while Brady still has a deal for the next two seasons. “If they keep Jimmy Garoppolo, at some point they’re going to have to pay Jimmy Garoppolo. 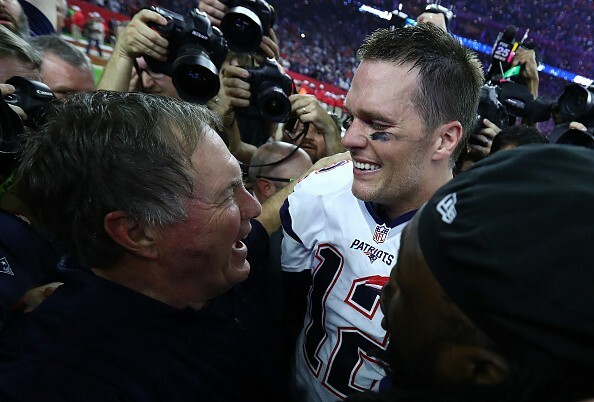 And at some point, there’s going to be a headlong collision between Tom Brady and Bill Belichick about Tom’s future,” Bayless said. The Patriots are the favorites to win the Super Bowl next year but the future of Tom Brady is still up in the air. If Brady finally accomplishes the perfect season, it might be time for him to retire and let the Jimmy Garoppolo era begin.